Lake Ontario waves hit the Port Ontario break wall. 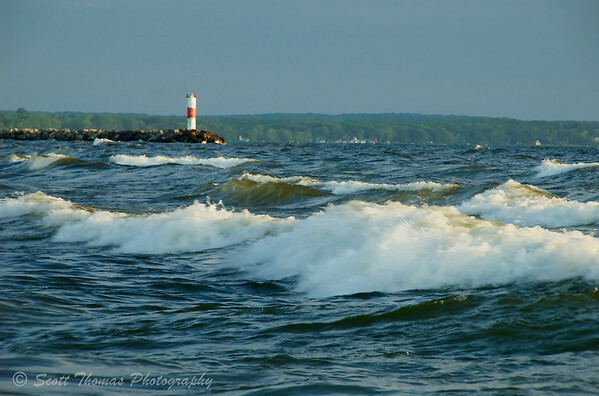 The Sun had disappeared behind some clouds late in the day and created some dramatic light on the waves. 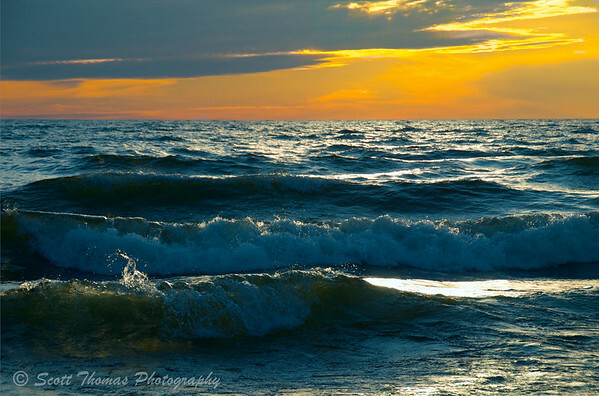 Dramatic lighting on Lake Ontario waves before sunset. When the Sun did pop out from behind the clouds just before it set, I was ready with the Tokina 11-16mm Ultra Wide Angle lens at 11mm focal length, aperture set to f/16 to create the star effect and hyperfocused for maximum depth of field. Sunset over Lake Ontario from its eastern shore. HDR image created from a single RAW file. I further enhanced the sunset via a High Dynamic Range process using a single RAW image in Photomatix Pro 3.0 plug-in for Aperture 3. 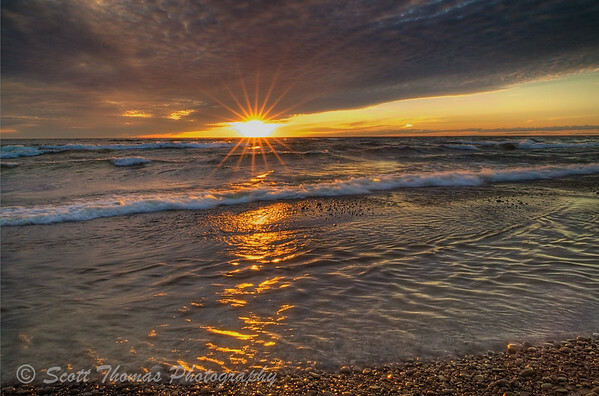 This entry was posted in Nature, Weekly View and tagged backlighting, hdr, high dynamic range, hyperfocus, lake, Lake Ontario, new york, nikon D70, Photography, photomatix, sunset, surf, tokina 11-16mm, water, waves. Bookmark the permalink. WOW! I can’t pick a favorite here, I love them all! The big waves make it look like you’re at the ocean. Always loved that about Lake Michigan, too. And the sandy beaches. Looks like a rocky beach here. The waves where around 2 to 4 feet. Small by ocean standards. Notice I was careful to keep any reference objects (aka people) out of these shots. 🙂 Glad you like them! Lake Ontario has very rocky beaches. The owners of the campground will drag the beach soon as it gets closer to summer vacation time. The water is still a bit nippy to go swimming yet. nice photographs you got there! esp the last one! Thank you, Sonu, for stopping by and commenting. Hi, Simone! A fellow photoblogger from Ireland. Enjoyed your blog and will add it to my blogroll. Those Cliffs of Moher put New York’s bluffs to shame. A WOW from me too! I love the drama and beauty you have captured. It must have been so nice to be there and listen to the wawes, acompanied by the sound of your camera shutter sound. The last photo is realy beautiful and special. I could hear the waves from my parent’s camp which is about a half mile from the beach. They were loud with a nice lakebreeze. My camera shutter I could hear but it didn’t bother the other people who were enjoying the sights. I love that second one, especially. I am pleased you do, BM. In my quest to look beyond what I would normally photograph. I found these waves backlit by the Sun behind the clouds very intriguing. I had to use a high ISO of 900 to get the shutter speed fast enough to capture them in this fashion. In the past, I would have just waited for the Sun to return. Oh, nice ones! I’m with Burstmode–I love to see light captured inside the waves. I like the star, too, and the foaming waves in the first shot. OK, I’m keeping them all. My first thought: W..! – but that has been used a couple of times already. I like these images very much Scott. They each show the waves in a different way. Beautiful! It looks a little cold there. Or is it just because we have heavy rain here in Denmark today. It was chilly because of the breeze at the beach but warm inland. A light jacket was all that was needed. That was the challenge once I decided the waves and not the sunset was going to be the subject for the day. I didn’t quite get the waves hitting the beach the way I wanted them. Will need to find a more rocky and wild looking place, I think, to get that one. The third photo looks like a whale smiling–the sun being his right eye. Ok. Yes, I’m weird. Love them all!! These are truly amazing! I love them all. Thank you, Deanna. Considering you have the Pacific Ocean nearby, I am pleased you think so. Those are money shots buddy! People have told me the Great Lakes can look like the ocean, but I somehow never quite believed. These shots make me a believer! I especially love the drama of the yellow sky in the second shot. You and your sister need to go on a road trip west. I’ll find her some interesting places to eat she can blog about. Sounds like a plan, Scott! Those are all terrific, Scott! Beautiful! Thanks, Terry! You have mountains, I have a great lake. Both are beautiful natural wonders we can capture. The camp is situated in a wonderful place along with many others. It is a little town in summer and very busy on weekends and holidays. The beach is a nice place to go this time of year. I showed another side of this beach in an older post you haven’t seen: View 27: Summer Joy. Hope you click to see it. Each one is absolutely beautiful and each is a favorite. I can almost imagine an old ship at full mast in the background horizon of the 2nd image. Super! Well, Anna, I might get a chance to see some of those ships on Lake Ontario later this month. Stay tuned! Wonderful images here; you know I love waves! And sunsets. No bugs either with the wind. Absolutely awesome Scott. You do the sunset justice. The last one’s an awesome shot, Scott. I really want the Tokina 11-16mm F2.8 lens. It’s gotten great reviews. Did you hand hold the camera or was it on a tripod? I used a tripod for the last shot as the shutter speed went down to 1/8th of a second at f/16 and ISO 200. The other two had much fast shutter speeds so I hand-held them. You do like HDR, Consuelo. I am not surprised. I love all 3 images, absolutely beautiful. Wow ! This are really inspiring ! I love the information you provide too, to help us all strive to understand the craft.